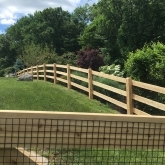 The fencing, masonry and lawn maintenance services provided by Roots Landscaping can transform a ho-hum yard into an exceptional piece of property. These services can enhance a lawn, increase a property’s curb appeal and boost a home’s market value. The experienced professionals at Roots Landscaping are committed to completing every job efficiently and safely. 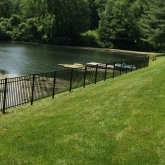 The company offers professional lawn services to business owners and homeowners in Bethel, Connecticut. Trimming, mulching, tree planting, controlling weeds and mowing are just some of the many lawn care and maintenance services provided by Roots Landscaping. Because the company respects its clients’ busy schedules and understands that no two yards are alike, it offers bi-weekly and weekly maintenance plans. From spring to fall, Roots Landscaping is Bethel’s top landscaping company to call. Mulch serves a two-fold purpose for plants and flowers by protecting them while complementing their beauty. The right type of mulch can maintain the soil’s nutrient, moisture and sunlight level. 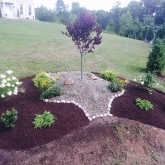 The experts at Roots Landscaping can not only advise property owners on what kind of mulch to use but also do the hard work that comes along with garden care. Those who want a new shrub or tree planted or existing shrubs and trees pruned can turn to Roots Landscaping for help. The company provides care and pruning services for plants, bushes and trees. Pruning is vital to a thriving landscape because it promotes plant health and growth and keeps lawns neat and tidy. No matter the season, Roots Landscaping can clean any lawn disasters. The company offers fall cleanings to get yards ready for winter and spring cleanings to prepare yards for summer activities. The landscapers will check the property, prune all shrubs and remove dead plants, branches, trees and leaves. Also, any Bethel resident whose lawn sustained damage during a storm can rely on Roots Landscaping to restore the property to its former pristine condition. Custom landscape design services can improve the appearance and monetary value of homes in Bethel. The professional designers at Roots Landscaping make sure each client’s vision is carried out by working directly with the homeowner. After discussing the client’s wishes and goals, the landscape designers create plans for the property to submit to the homeowner. The designers can incorporate various trees, shrubs, annuals and perennials into the plans, and they can include pathways and stone walls. Roots Landscaping also caters to the specific needs of commercial property owners, and the company has worked with some of Bethel’s leading businesses in creating their landscape designs. The choices of features that the company can add to the landscape include small ponds and water elements that blend seamlessly into the property’s greenery. When it comes to creativity, Roots Landscaping has it in spades. The company possesses the diligence, resources and desire to complete projects by the deadline while meeting all of the property owner’s specifications. In regard to amplifying the curb appeal of an office or business facility, landscaping expertise is crucial. When customers and clients arrive at a business, they base their first impression of that business by the exterior of the building. 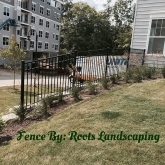 Roots Landscaping recognizes the unique needs of its commercial clients; therefore, the company offers business owners premium fencing, masonry and landscaping services. Before starting any project, the landscaper will explain every step of the process to make sure the client knows what to expect. The company’s experienced landscapers provide top-notch service by using tools and equipment that meet industry standards. Roots Landscaping is happy to help any business owner in Bethel, CT boost the appearance of their commercial property. Roots Landscaping prides itself on being a first-rate landscaping service provider that is accredited by the Better Business Bureau. Those who want to get more information about how the company can help improve and maintain their landscape should contact Roots Landscaping now. A member of the team is also available by phone at 203-304-7326.